January 11, 2016 | ProgressTH Want to get into gardening but don't know where to start? Potted plants can only get you so far. If you've got a bit more space ... on a rooftop, in an empty lot, or out back ... you may want to consider raised garden beds. While most people have surely seen this indispensable gardening technique, they may not have realized the concepts or benefits behind using them. Once you understand why they are used and the advantages they provide, you may be more tempted to try it out yourself. Raised bed gardens consist of a width of raised soil twice as far as you can reach over (because you can access it from either side and bridge the entire gap). It can be any length desired, just remember you'll have to have access to both sides. They are incredibly simple to make. Simple get a pile of soil, and construct a barrier around it to hold the soil in. Finding materials to make a barrier is not as hard as it may seem. The elevated soil is held in place by a barrier which can be made of virtually anything. 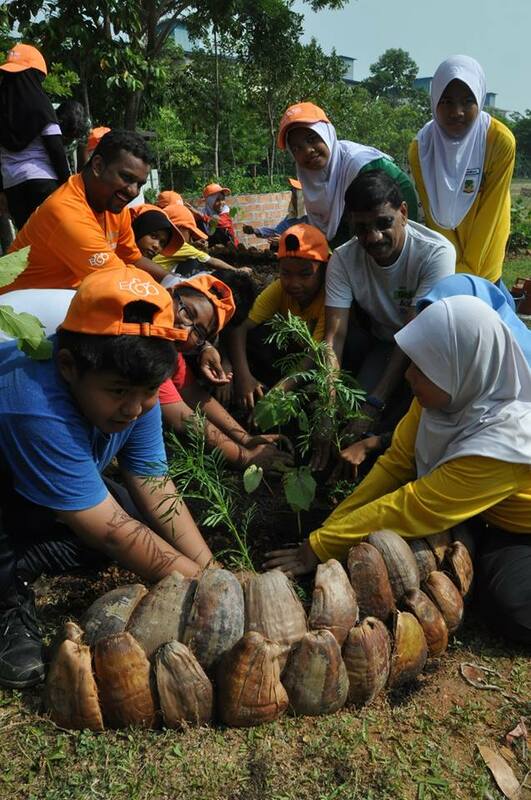 Natural materials might include logs, coconut husks, bamboo, rocks, or intertwined branches. 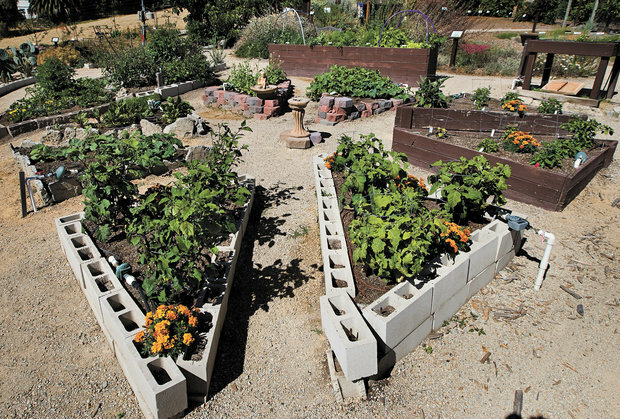 In this picture, you can see cinder blocks, wood, and landscaping bricks all used for different raised beds. In an urban environment, discarded or leftover bricks, cinder blocks, glass bottles, and railroad ties can work as well. Just try to stay away from materials that may contain hazardous materials or coatings, as you'll probably want to grow plants you can eat and would like to avoid them taking up chemicals leached into the soil by your material of choice. If you are unsure, simply look it up on the Internet as someone surely has looked into the material you are considering already. Coconut husks used for raised-bed gardens. First of all, the bed is raised, meaning that the soil is less affected by the temperature of the rest of the ground. If you live in a tropical region, this particular aspect is less of an advantage, but if you live in a more temperate region, it can possibly help extend your growing season. Regardless of climate, raised-bed gardens generally have plants placed close together. This close proximity helps crowd out weeds. When plants get taller, and as their leaves begin to touch with neighboring plants, little sunlight is available for weeds that might want to take root. And just as little sun can get to the ground level, less water will evaporate above this micro-canopy after watering. Drainage is also less of a problem. Most raised beds use material that is not entirely waterproof, allowing excess water to flow down and out more easily. If you plan your garden well, you may even be able to reclaim some of this excess water. Another benefit is that you'll know exactly where the soil came from that is in your bed, and you know that it won't be going anywhere. The walls of the beds prevent erosion and keep your gardening soil right where you put it. This becomes particularly useful when you use compost to help feed your plants. Healthy soil will remain in your garden to be used and reused over and over again. And because you're using nutrient-rich soil supplemented with compost, and because your plants are spaced so closely together, yields will go up versus traditional row planting. Row planting's advantage is that it can be done less labor-intensively and on a much larger scale than raised-bed gardening. But if you are making a personal garden, a rooftop garden, or a community garden, raised beds are clearly worth the effort. 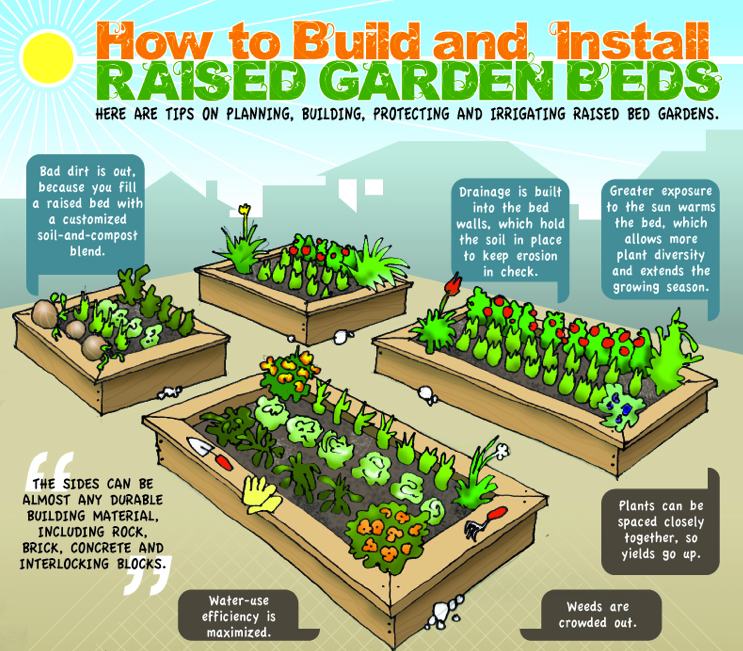 And just because many people use raised-bed gardening in a low-tech setting, doesn't mean you can't upgrade this useful concept. The opensource FarmBot system is basically a robot that hovers over a raised bed on a computer-controlled gantry and does everything from planting seeds automatically to watering, and monitoring them. Because it is opensource, anyone anywhere can add their own tools to the robot's arm to help automate gardening. 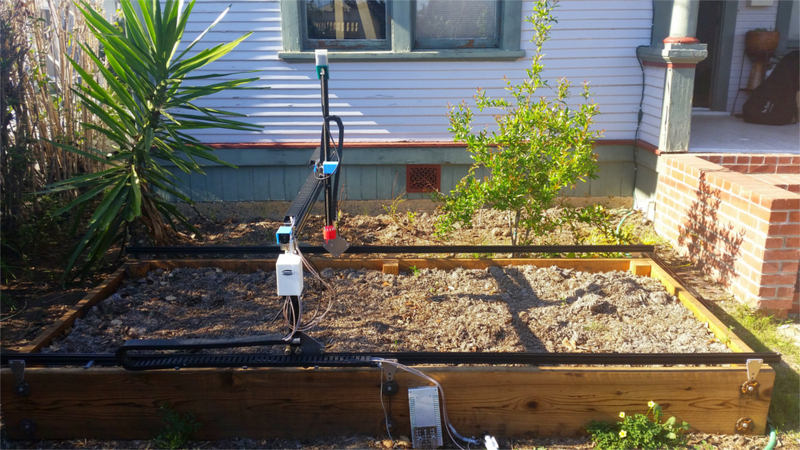 FarmBot is a computer-controlled gantry and tool head that can tend a raised-bed garden. It is opensource, meaning anyone can get the designs, use them, and improve upon them. While some may see this as defeating the purpose of gardening, we must remember that not everyone may be as interested in connecting with nature as we are, in the way that we do. Introducing a technological twist can get more people than ever outdoors and their hands dirty. There is also the possibility that such innovations could make raised-bed gardening a more efficient and economical way to produce organic food locally.